Let us proudly present the vehicles of Authentic Slovakia Tours. These vehicles are being used during our Post-Communist Bratislava Tour (and can be used also for Devín Hike and Drink Tour) according to their technical conditions and availability. Of course we focus on authentic Czechoslovak brand Škoda. 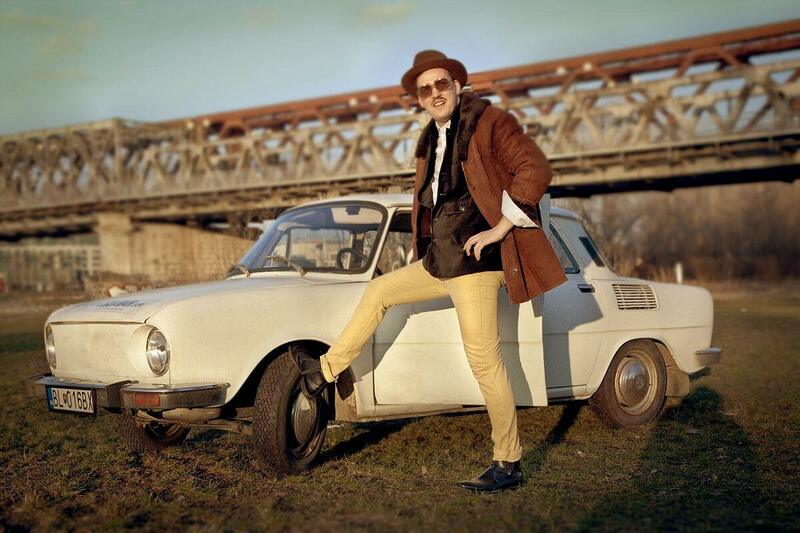 Our 1970's - 1990's models provide you all the comfort you could expect from (post-)socialist vehicle. Our blue angel. Modrášek makes people smile. Its innocent colour and charming design are well combined with classy original artifical-black-leather interiour. Roof rack is ready to take your luggage. But the real adventure starts, when you start the 1-liter engine. No, it is not a truck, it is Škoda model 100 produced from 1969 - 1977 in Czechoslovakia. Typical communist middle class car providing joy for the masses. Belášek is a family heritage of Brano and Peter. Our grandfather used this car since 1974 in the rural region of Myjava nearby Czech border. 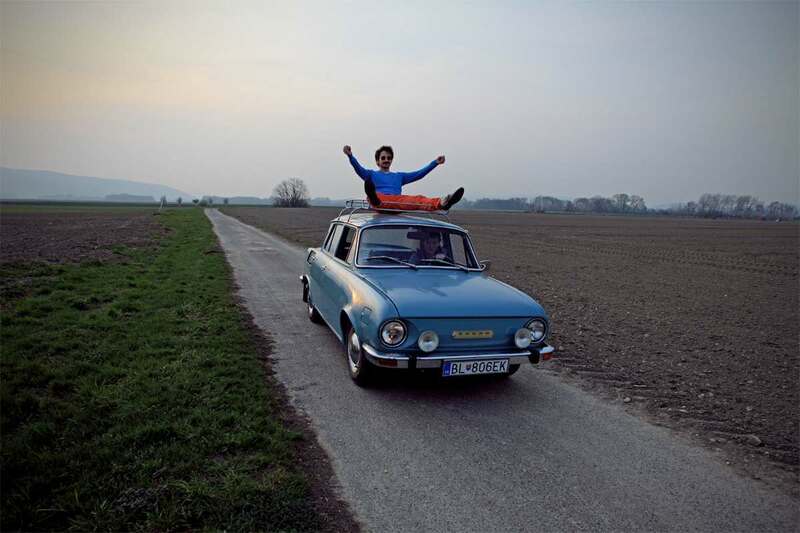 This Škoda model 110 L experienced several journeys to former Yugoslavia and communist Bulgaria. "L" stands for "luxurious" - slightly bigger engine (1,1 litre), bigger steering wheel, ashtrays at the back seats, classy black interiour. Škoda 110 R Coupe version became famous as a successful sport car with catchy design, too. Zelda, made in 1979, is the first type of Škoda 120 model, follower of the popular 100 and 110 models. 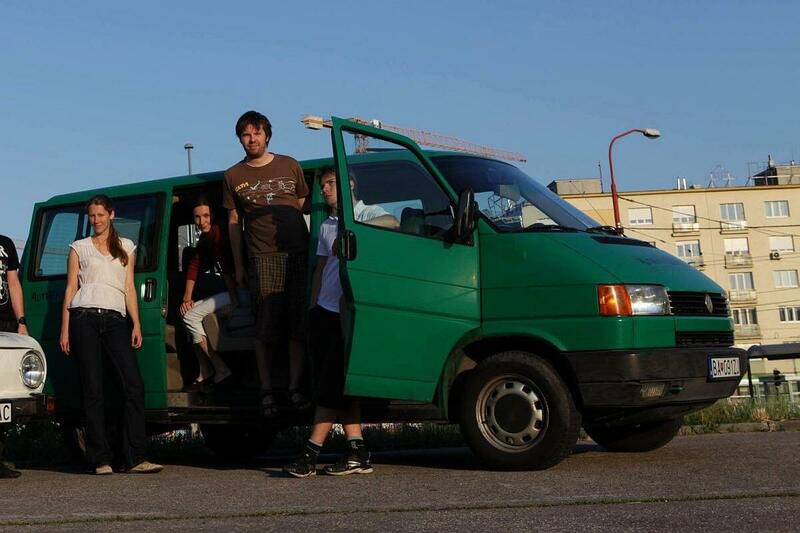 Zelda served for our tours in Košice for some time, but it ended in Bratislava after all. 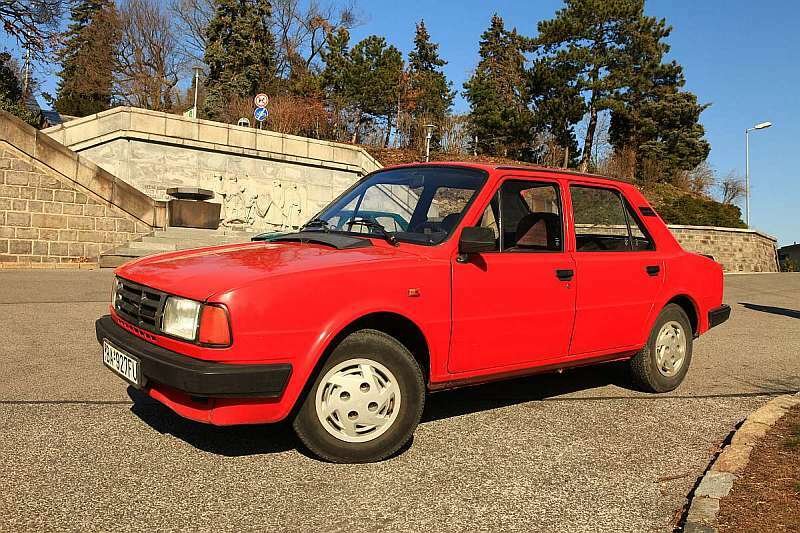 Shining red Ferrari, one of the newer models of Škoda 120, was waiting for us for years in a garage in Petržalka neighbourhood (southern Bratislava), the largest communist-era housing project in former Czechoslovakia, only a few hundred meters from Austrian border. After starring in the Amnestie movie, Ferrari is now ready to take you for the speedy ride with seat belts! The colour of this car expresses the spirit of the communist era. This beauty was born just 1 year before the fall of the Iron Curtain - 1988. Those years you hardly found another brand on the local parking places than Škoda. Good news, this car has seatbelts and opening windows also at the back seats! This legend of German transport in 1990's was our first vehicle and still serves well today. 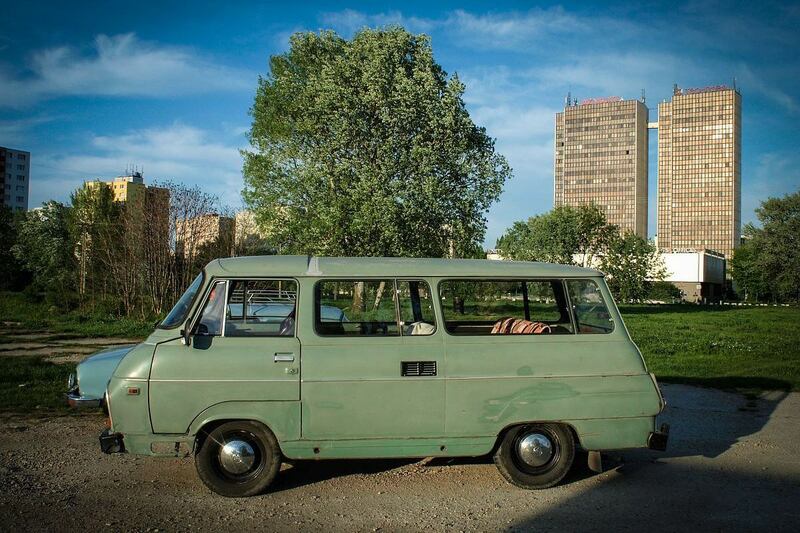 Green Volkswagen can comfortably carry 8 passengers and allows good views to the post-communist landmarks behind the windows. Produced in 1992, it is unbelievable that Caravelle is the same age as Škoda 1203. 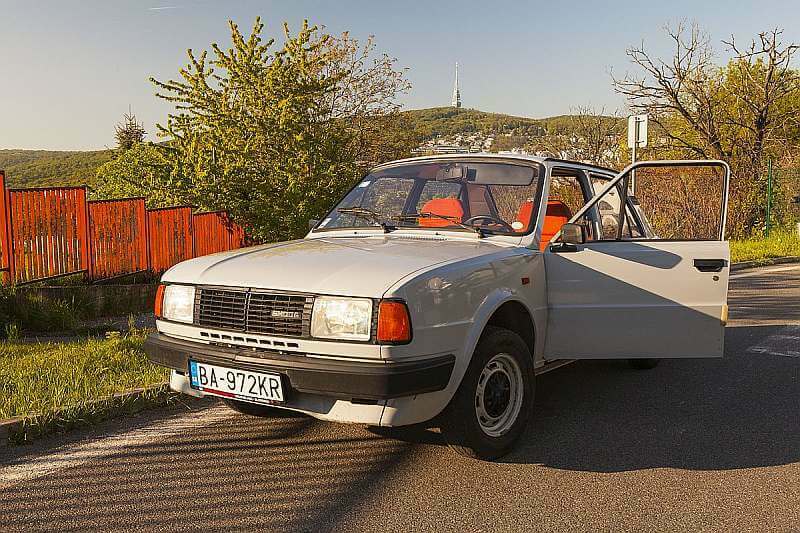 Škoda 1203 / TAZ 8-seater was being produced in (almost) the same design for amazing 31 years (1968 - 1999). Škoda 1203 cars were often used as ambulance cars, funeral cars or utility vehicles. What is unique, the engine is located in the interior, right next to the driver, so anyone can take a look what is going on during the ride, when in doubts! 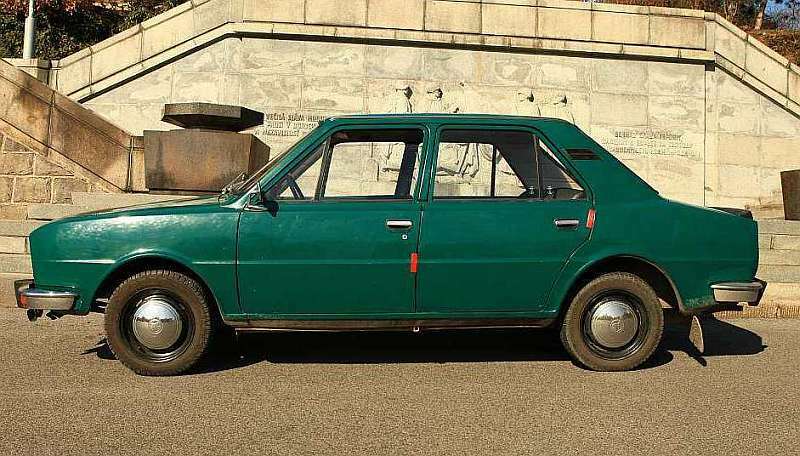 The level of noise inside of the car is crazy, stability of the car is horrible and it is probably the crappiest vehicle produced in Czechoslovakia ever. But joy from the ride is all worth it!